The Smile Again: 7 Days to a Happier You system has been designed in daily, simple steps so that you can reclaim your power, heal your emotions and move forward with a more fulfilling life. Are you tired of feeling constantly at war with your emotions? Are there days you feel drained, overwhelmed, and like you're hanging on by your fingernails trying not to lose it? To feel more calm, clear, and connected with those you love? 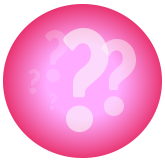 To have more energy and get that excited sparkle back in your eyes? 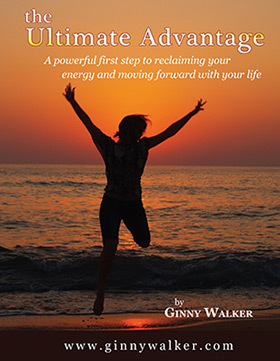 To feel empowered and finally free of the emotional stress that's been keeping you down? 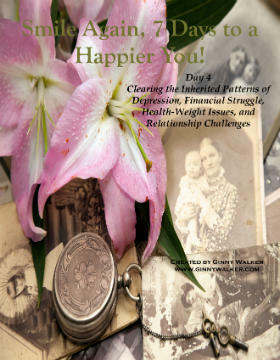 Discover step by step how to get your life back with this transformational home study program. 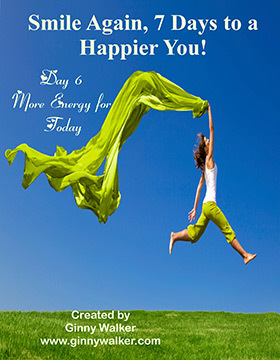 In Day 1 of the Smile Again Program you will learn about the different energy systems in the body and some simple techniques that will get your energy flowing in the right direction. Emotional blockages can leave you feeling tired, unmotivated and depleted. Learn how to clear these emotional blockages so you can re-energize and feel more vibrant and alive! Discover why your body's energy system is in reverse and get it flowing in the right direction so you can feel energized and alive rather than drained and disconnected. **Includes audio program and accompanying handbook. 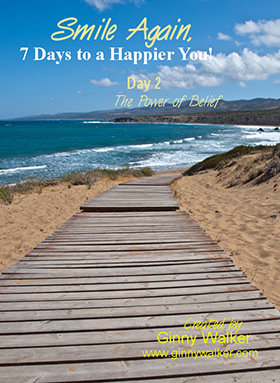 In Day 2 of the Smile Again Program you will discover how limiting beliefs can keep you from getting exactly what you want in your life. Unfortunately many of us want to believe that we deserve good things in life but subconsciously we don't really believe that we deserve to be happy. These limiting beliefs can keep you from moving forward in your life. Learn how to release and change these beliefs so that you can create a life where your dreams can become reality. In Day 3 of the Smile Again Program common negative emotions are identified using a helpful illustration of your emotions as a ladder so that you can not only identify where you are but also see a more realistic path to reaching happiness. The emotional ladder not only shows you the different steps to take to move up the ladder but also gives you an understanding and acceptance of where you are right now. These simple steps will help you to accept yourself and teach you to use your emotions as guidance rather than pain and needless suffering. In Day 4 of the Smile Again Program the inherited emotions and generational pain are introduced. You've heard the term that history will repeat itself if you don't learn from it. Well the same is true when it comes to the emotional energy that is inherited from your family and generations past. It's important to clear and release these emotions so that you can put an end to repeating the same struggles over and over again. This will give you more time to focus on your own healing. In Day 5 of the Smile Again Program the critical voice in your head that tells you that you aren't good enough will be reprogrammed to not only believe but to know that you are good enough and you deserve to be happy. Learn some simple techniques that will help you to release those self-destructive patterns and free yourself from the emotional and mental prison that your mind has created. Because you exist you deserve happiness. Take control of your life and be happy! In Day 6 of the Smile Again Program you will learn to unplug your energy from people or past events that caused you emotional pain and continue to drain your body of its energy. Forgiveness is a powerful tool that will help you to release the pain and burdens that continue to cause you suffering. After releasing these painful emotions you will have more energy for today so that you can live in the present moment and enjoy your life. In Day 7 of the Smile Again Program you will take everything that you have learned in the previous programs to the next level. The state that you wake up in is usually a good indicator of how your day will go. Use these simple steps to clear the negativity of the day so that you can sleep well and wake up feeling refreshed. Taking care of your whole body will become easier when your energy is restored. 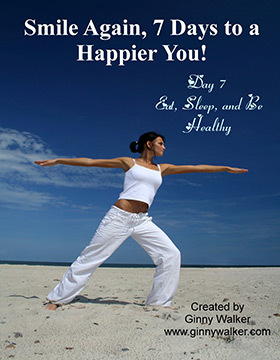 You'll choose nutritious foods, move your body more and sleep peacefully. 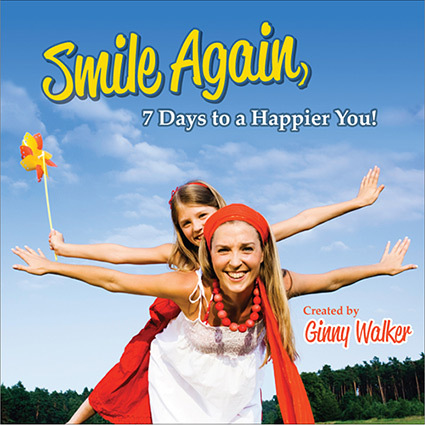 The last day in the smile again program helps you to achieve balance in all areas of your life. This program is designed for the difficult days when you're feeling low and nothing seems to help. This bonus program is designed to be soothing and comforting. 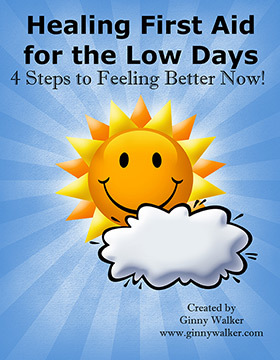 In it you will learn 4 simple steps that will help you to feel better about your situation and life and also give yourself some much needed empathy and support when you need it the most. 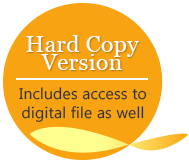 Includes lots of extra tapping scripts to do the work for you when you're having a bad day and just not up to doing it yourself.